A little while ago I was looking at my MacBook Pro, which is a 15 inch 1680×1050 Anti-Glare with a 500GB 7200 Hard drive and got the itch to tweak it out a little bit. I really wanted to try an SSD drive which I’ve heard so much about…..
Ok that’s a TOTAL lie… What really happened is that my wife needed a new desktop, and when I spec’d it out I made sure she had an SSD drive for the OS. I thought I could handle her having one and not me. TOTAL FAIL! So I sprung for a SSD drive for my laptop. Actually I splurged and got one of the bigger “affordable” ones which is a 240GB Mercury drive from macsales.com. I told myself it had to be that big because I really wanted 2 of my notes VM’s to be on the SSD drive, but I KNEW that I couldn’t live with only a 240 GB hard drive. So rather then carrying an external USB drive with me – I had to sacrifice the optical drive and go for two hard drives – moving my original to the space where the optical was. Conveniently, macsales.com sells a special bracket to do just that. Let me tell you. The hardware moves were EASY. Macsales had high quality videos show everything you needed to see. What was difficult to me, was actually the OS. It seems on the Mac, if you want to install to a SSD in the boot drive, you better have a 10.6.4 OS disc. Earlier versions would not install in the boot drive. I ended up putting the SSD into my mac Pro and installed and updated it there. Was quite a pain actually. But it did work. Am I happy with all this and the SSD? Unbelievably so! I like that I can start a full Windows 7 VM in like 12 seconds. The mac apps are all but instant. It’s just a beautiful thing. And I ended up with more disc space then I started with. Do I miss the optical? Not really. I rarely use it. And even if i did get an install disc it’s easy to convert it to a DMG file. So I truly think I’ve extended the life of my laptop until at LEAST Apple’s next refresh of the MacBook Pro line. 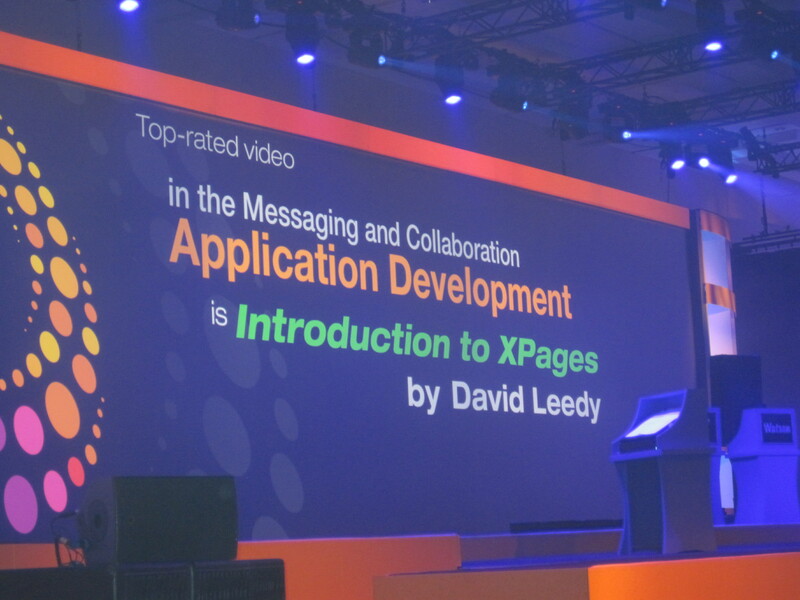 Some time ago, I did another show called: Introduction to XPages. That 73 Minute show was always meant to be “Part 1”, and “Beyond” was meant to be “Part 2”. Taken together I consider this a free XPages Jumpstart coming in right around 2 hours. I’m particularly proud of the “Beyond” show as there are TONS of demos from pretty basic to a little more advanced. But rather then just show a video of demos, I wanted to come up with something that might be a little more helpful. I really like the Demo app of the XPages Extension Library, so I decided to come up with my own. No Extension Library needed. The first purpose of this site, is to be the home site for the XPages Cheatsheet(s). In addition to holding the PDF’s, this site also contains many of the Demo’s used in the “Beyond” show. I’m making the template, cheatsheet.nsf, downloadable along with the FakeNames.nsf data database that I use. Feel free to pick it apart. It’s my intention to try and continue adding to this database with additional tips and demos as I create more NotesIn9 shows. I hope the video and demo app area good resource to the XPages community. Domino Designer on Mac – It’s Social Business! I just wanted to jump in on the blog posts today about Domino Designer for the Mac. This really needs to be made a priority by IBM. Sure, in the grand scheme of things Apple’s market share is still lower the Windows. But Apple has tremendous GROWTH, and GROWTH is what Notes/Domino needs! How many speakers at Lotusphere are using Mac’s? A LOT of them. But they’re crazy enough to use virtual machines. How many students use Mac’s? A LOT of them. But they’re NOT crazy enough to use Virtual machines. Please IBM – this has to get done. This is like Social Business really. Take Designer to where the people are going! If it’s easier – don’t do the “full” designer. Do a light version that just has what’s needed for XPages. That’s would be a great product right there! The Notes/Domino community is a great one. We can evangelize. We can even educate by creating Wiki articles, podcasts/screencasts, and even answer questions in forums and twitter. But the community can not bring Domino Designer to the Mac. Only IBM can do this. Please IBM – make this a priority. Bring Designer to the Mac so all these Mac people who want the best hardware, can now have the chance to create web applications with the best Web application server out there – XPages via Domino. In this show I try and do something rather dangerous. I attempt to explain a Tim Tripcony blog post on creating Fancy TypeAheads which are TypeAheads that show additional data in the lookup results. This helps aid the user to select the correct record. So anyway – here you go. I hope you like it. I’ll be bring NotesIn9 Live to Chris Miller’s IDoSphere next week on Tuesday Feb 15th at 8:30 AM EST. My session is XPages: Beyond the Introduction. It’s kinda meant to be the second part of an XPages Jumpstart where the first part can be found in my Introduction to XPages Video. Anyway, I’ll be talking about using XPages to do some common things. We’ll bind to foreign databases, take an indepth look at repeat control tricks, and maybe even take a peak at some custom object in SSJS. In the original version I talked about BluePrint CSS but I might replace that for another neat repeat control example. You’ll have to tune in to see! IDoSphere is a 2 day virtual conference. With presentations that were NOT used at Lotusphere. There is a SMALL registration fee but the coupon code IDS2011DL will get you 10% off. My session will make it to NotesIn9, but IDoSphere has many more sessions with much better speakers then me. So if you missed Lotusphere, or even if you went, I suggest that this is worth checking out.